VoIP technology can be applied to all types of contact centers including inbound call centers, outbound call centers, and virtual call centers that work with outsourced agents. A VoIP contact center or VoIP call center is a contact center that operates on VoIP technology instead of traditional phone lines. Whether your company has an inbound contact center, outbound contact center, virtual contact center, or any other type of contact center, cutting the cord on your phone line and replacing it with a VoIP solution can bring many benefits to your business. VoIP for business is cheap to set up, it’s reliable, and it enables the inclusion of an infinite number of features. The top VoIP providers offer dozens of features to help make your contact center the best it can be. These include things like detailed real-time reporting on customers and agents, interactive voice response (IVR) and automated call distribution (ACD), and customer speech analytics. We recommend looking at things like price, features, and system reliability when comparing VoIP contact center providers. 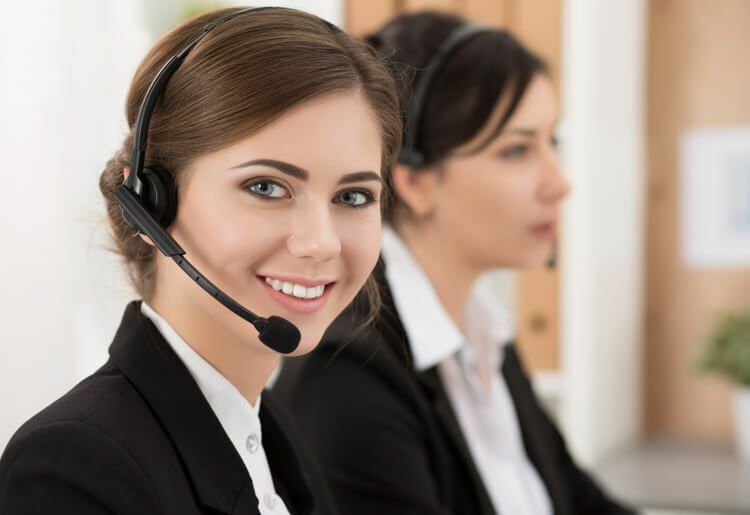 The best VoIP call center provider for your business is the one that offers features specific to your company’s contact center needs and call volumes. Vonage is one of the largest and most popular VoIP for business providers. It caters to all types of businesses, from small and medium-sized businesses to large corporations. Best of all, each of its subscription packages includes the option of integrating full contact center functionality—no matter the size of your business. Vonage went one step ahead of its competition in 2018 with the launch of Vonage CX Cloud, a sophisticated omnichannel cloud contact center solution. Vonage business customers of all sizes can customize the Vonage CX Cloud through Vonage’s API platform. Real-time insight into caller sentiment and emotions, enabling better decision making and customer support. Chatbots, visual interactive voice response, and other self-service capabilities that help resolve customer queries quickly and seamlessly. Automatic call distribution, including universal queuing and call routing based on agent expertise. Advanced analytics, including recurring custom reports, real-time metrics, and historical data. Workforce optimization tools, including automatic desktop call recording and simplified agent scheduling. RingCentral is another popular VoIP provider that services businesses across all types and sizes. It offers 3 standalone call center packages ranging from a cheaper package with basic features to a more expensive package with advanced interactive voice response and automatic call distribution features. All contact center plans integrate completely with RingCentral’s VoIP for business, which includes unlimited calling in the US and Canada,and seamless CRM integrations like Salesforce. Interactive voice response (IVR) and automated call distribution (ACD). Omnichannel capabilities include email, chat, SMS, and social media. Outbound features include preview dialer, progressive dialer, predictive dialer, and campaign management. Workforce optimization, including performance management, omnichannel analytics, workforce management, and quality management. 8x8 offers plenty of choice when it comes to setting up a contact center. It appeals to all types of businesses, with solutions for inbound and outbound voice call centers; multichannel operations spanning voice, email, SMS, and chat; and, best of all, virtual contact centers, unifying your headquarters with outsourced or remote operations. Powerful speech analytics, letting you analyze the most important customer interactions instead of just randomly selecting a small percentage of calls in the hope of identifying patterns. Historical reporting, helping you give contact center managers the information they need to make smart business decisions. Skills-based routing, matching callers with the agents that can best meet their needs. Interactive voice response, which streamlines customer flow by quickly connecting callers with agents. Web callback, which allows customers to get assistance from your agents at the touch of a button. Jive specializes in supplying VoIP solutions and call-center facilities to small and medium-sized businesses. Jive’s cloud-based contact center is built on a principle of offering businesses an affordable contact center with basic features, real-time reporting, and good call management. It offers customized plans starting from $99.95 per user per month. Jive has also partnered with inContact to provide an enterprise-grade contact center solution that includes omnichannel integration, advanced reporting features, and outbound dialer. Real-time queue reports, letting you know how many agents are on calls, and allowing you to measure their active talk time. Agent summary reports, which helps with training and rewarding employees based on their performance. Live status wallboards, displaying real-time information about your contact center’s overall performance. MegaPath offers a 2-tiered pricing system for its contact centers. Both packages included a long list of features suited to inbound, outbound, or mixed contact centers. All customers get free live one-on-training for call center agents, supervisors, and administrators. Customized greetings and announcements, including queue announcements, audio and video announcements, and whisper announcements. Call-routing capabilities, including intelligent ACD, priority queue routing, and real-time agent management. Agent availability management, including join/un-join call center, setting ACD state to available or unavailable, and automatic timed wrap-up at completion of ACD call. Call presentation features, including calls in queue notifications, longest waiting priority, held-call notification, and last agent sign-out warning. Call handling, including one-click transfers, escalation or emergency escalation of call to supervisor, silent monitoring, and call barge-in. VoIP contact centers can vary significantly, and it’s therefore imperative to shop around before settling on one. For example: Vonage specializes in offering real-time insights into customer interaction; RingCentral is a good option for an omnichannel solution; and 8x8 is best for outsourced call centers. Before asking for a quote, ask yourself what it is you need from a contact center and then check to see which VoIP provider can make it possible.